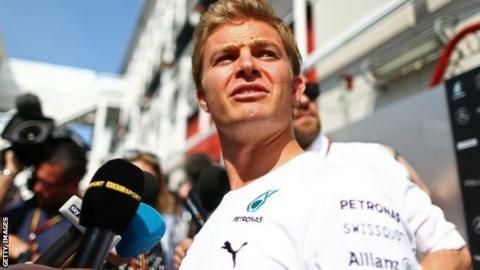 Nico Rosberg says he must stop Mercedes team-mate Lewis Hamilton's run of successive victories at this weekend's Spanish Grand Prix. Hamilton has triumphed in all three races since retiring from the season-opener in Australia, which Rosberg won. Rosberg said: "Every weekend is crucial but the results momentum is on his side and I need to try to turn it around. "Definitely that is the case. I have come here to win, to try to extend the lead in the championship." Lewis Hamilton has completed 169 racing laps out of a possible 224 this year (following his retirement from the Australian GP). Of those, he has spent 164 in the lead (97%). Hamilton is four points behind his team-mate in the drivers' standings and the Mercedes car has such a performance advantage that the two are effectively competing for wins only with each other at every race. Hamilton said: "This is a much more intense season so far and perfection is required every weekend to get that result, especially when you have a good team-mate who is also doing an exceptional job." Hamilton has out-qualified Rosberg in three of the four races so far this season, each time when there was a wet qualifying session. Rosberg said: "What I need is a normal weekend and then I'm sure I'll be able to turn things around." Both men said they expected the nature of Barcelona's Circuit de Catalunya could mean they face a tougher challenge from their rivals than has been the case so far. Long, demanding corners predominate at the track, which is renowned as one of the severest tests of a car's aerodynamic capabilities on the Formula 1 calendar. The competitive order may also shift as Barcelona is a race where teams traditionally bring their first big upgrade package of the year. Hamilton said: "It depends what step they make but the Red Bulls are at the back of my mind. "They have perhaps a little more downforce than us, they just don't have as much power. "This is very much a downforce-dependent circuit, so you'll get a real good indication of how good their car is." Alonso finished third in the last race in China after a troubled start to the season for Ferrari, but said he would not start the weekend of his home race expecting to repeat that result. Murray Walker's F1 report card - who's top of the class? "We will do our best but we know it will be a tough weekend. Today, sitting here, if I tell you I will fight for the podium, I would lie to you and I don't want to do that for all the people coming," said the 32-year-old, a hero for the tens of thousands of Spanish fans who flock to the race. Four-time champion Vettel, who has been beaten by team-mate Daniel Ricciardo in the last two races and is struggling to adapt to the new Red Bull, said: "Mercedes are in a very strong position. They are difficult to beat, but it's never impossible. "At the moment there are a couple of things we need to get on top of and then it should be a different story."